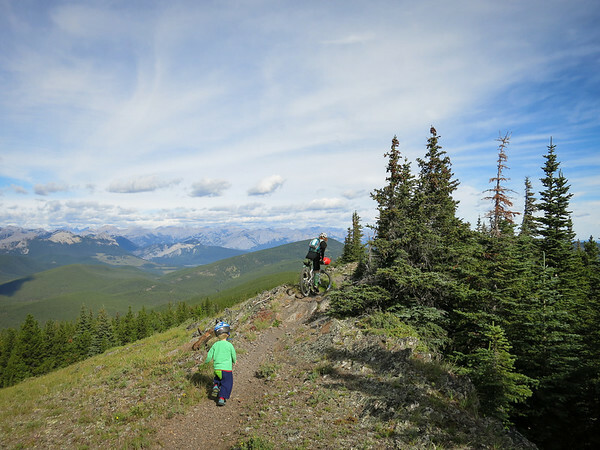 We’ve cycle toured before, and with our son we’ve done lots of camping: overnight ski touring, multi-day hiking trips, and plenty of mountain biking day trips. We had managed to acquire a Tout Terrain Singletrailer at the start of the year, and had been using it non-stop since for toddler single track adventures. 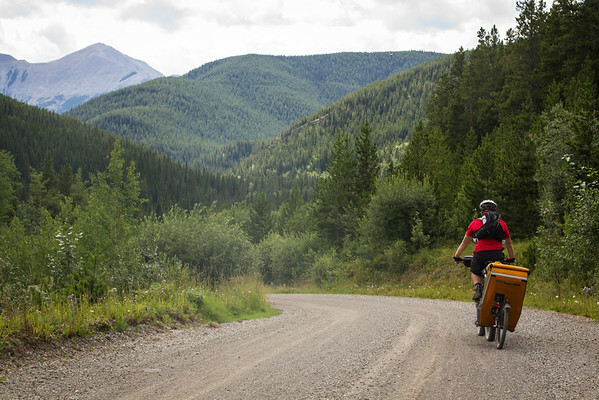 But this was going to be the first time we would combine everything into a bike packing trip. Apart from the Singletrailer, our set-up wasn’t very hi-tech, but it definitely worked for our purposes (although I’m sure Alex would have been happier if I had more weight-carrying capacity). We’d been hoping to get out on a few overnight trips this summer, but our options had been limited by the flooding in June. 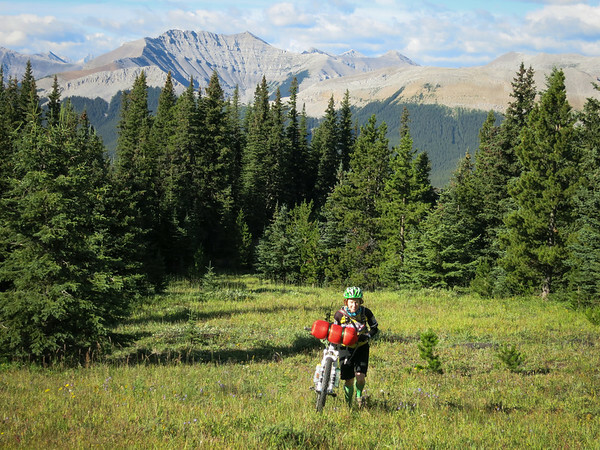 Thankfully Kananaskis had finally opened up a little, and so we set on Jumpingpound Ridge as a likely destination. Here’s my faithful steed all kitted out for the ride. Thermarest strapped under saddle, all our sleeping gear strapped onto handlebars (with some dodgy home-made straps we knocked up). 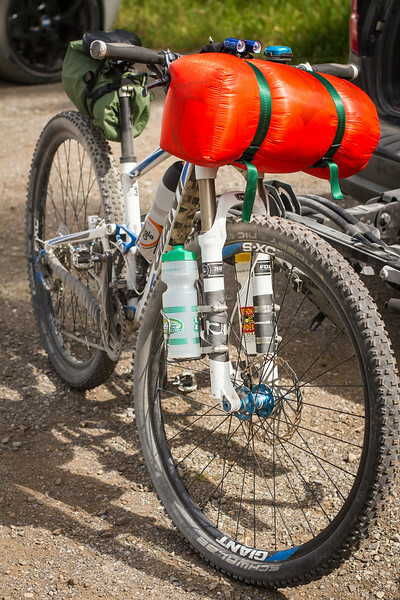 Extra water carrying capacity on front fork. We both wore hydrapacks to carry our spare clothes/extra layers plus a few other bits and pieces. 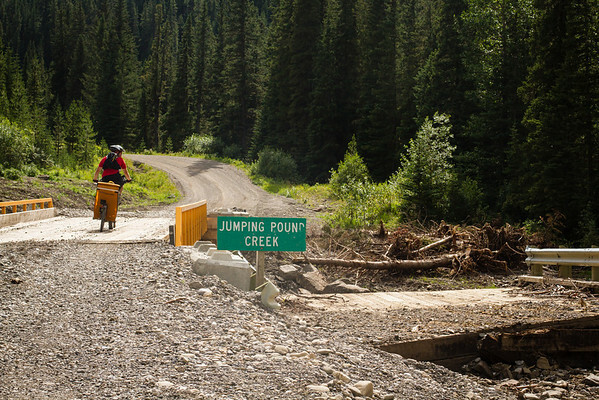 After unloading and packing at the Dawson Recreation Area, it was off down the Powderface Trail – closed to public vehicles at the moment, as it’s being used by Shell while their usual access road is still inaccessible post-flood. It made for a rather pleasant ride, as there were hardly any vehicles driving past and creating huge lung-coating dust clouds. As a result we could actually enjoy the wildflowers and small animals hopping about the place, squeaking furiously at us. After our quiet gradual uphill along the road, we turned to the east, and started climbing up the Jumpingpound Summit Trail. 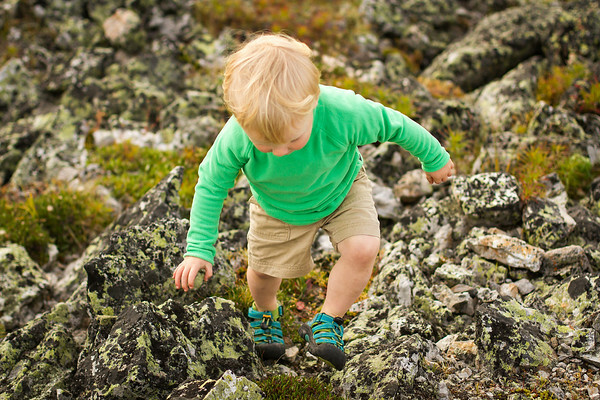 It’s the shortest path to the summit, and also the easiest. Nontheless, some pushing was required. 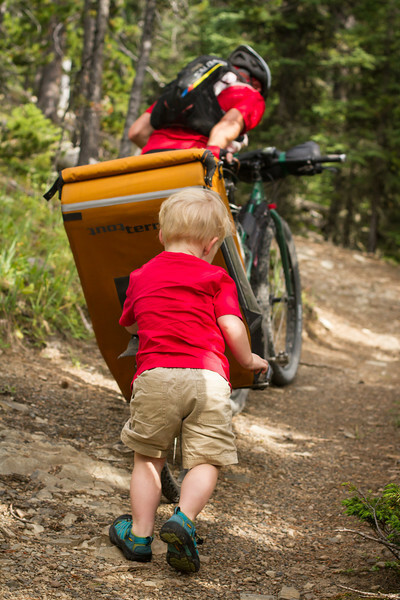 Our son was booted out of the trailer and helped push Papa up the hill. 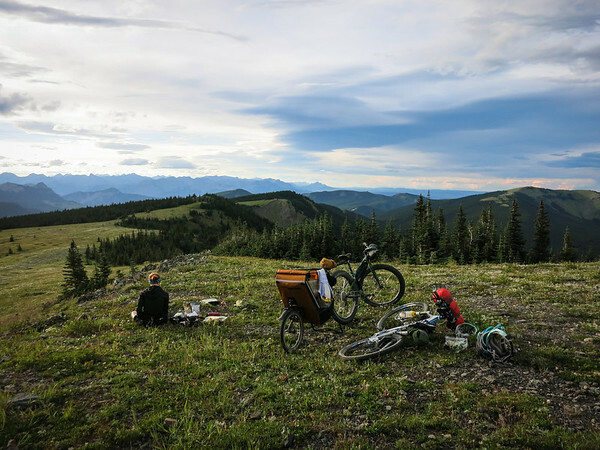 We had dinner on the ridge, just below the summit – just some pasta combined with dehydrated meals. Not fancy, but nice and warm. And we did a little rock climbing. As we ate, the weather had started to get a little wild. The wind was picking up, and there was rain threatening from the west. We beat a hasty retreat down into the trees, and set up camp in time to be rained on for a while. 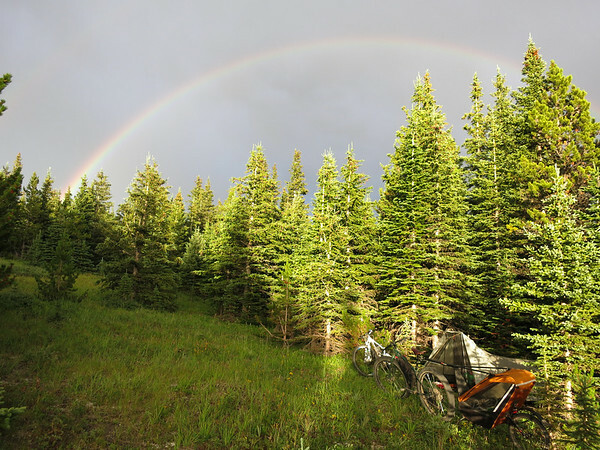 The shower was short-lived, and we emerged from our tent to a rainbow! After a little exploration, and hanging-of-the-food-so-bears-don’t-eat-it-or-us, we retreated to the tent for the night and tried to get some sleep. It wasn’t the best night we’ve had in the tent, but we were warm enough, and all got some sleep at least. The following morning dawned cool and sunny, and we emerged from our warm shelter and pushed back up to the trail. And then a wonderfully fun descent, totally rideable for Alex with the trailer even, as we turned down the Jumpingpound Trail rather than riding up Cox Hill (as tempted as I was). To regain the road we had to ford the mighty river, as the old pedestrian bridge was still out. Thankfully it wasn’t terribly mighty, and it was actually quite easy to ride across. And from there it was largely downhill back to the car, hoorah! More details: We started and finished at the Dawson Recreation/Camping Area, where the Cox Hill trail joins the road. The road is currently closed to public vehicles beyond that point. We both brought enough clothes to wear overnight and keep warm (I was longing for a down sweater, glad I had buff and toque), with spare knicks, socks and underpants. I have a Singletrailer too, and am always surprised what I can ride with it. They’re absolutely brilliant – we were debating the cost for ages, but for the amount of awesome stuff we’ve been able to do with it, it’s been more than worth it. 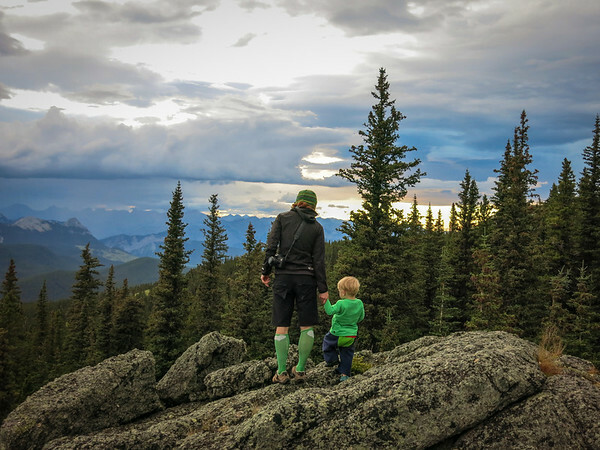 The only issue now is that all of the more fun trails to do around here involve a lot of climbing, and our son’s not getting any lighter…. Great write up and awesome pics. Just a quick question about your steed, how do you like the giant anthem for bikepacking? I see your partner rides a krampus how does it like that bike? Heya Todd, thanks. The anthem doesn’t work super well for bikepacking I found – it’s ok, but I had to have the rear suspension locked out to be able to store anything under the saddle, then there was basically no frame storage space, and I had to have water bottle storage on the front forks and carry a backpack. It did mean I wasn’t carrying so much gear though, which was fun for me! And it’s definitely been workable on shorter trips, a good way to force yourself to travel light. 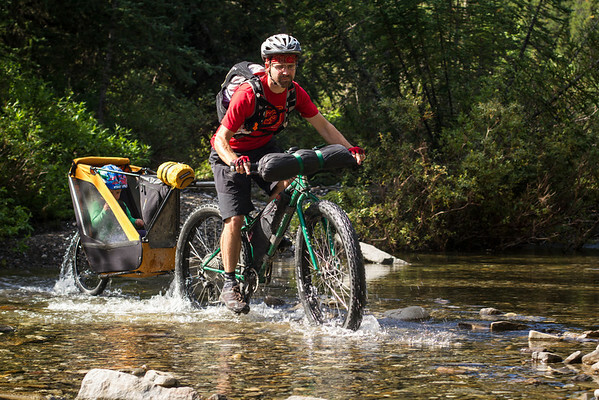 My partner loves the Krampus, it’s his ideal bikepacking bike – although he is actually ordering some new gears/cranks to lower the range a little and make life easier on the uphills, seeing as he does most of the toddler towing. I am not sure if you will get this, but did you need a permit to camp out there? 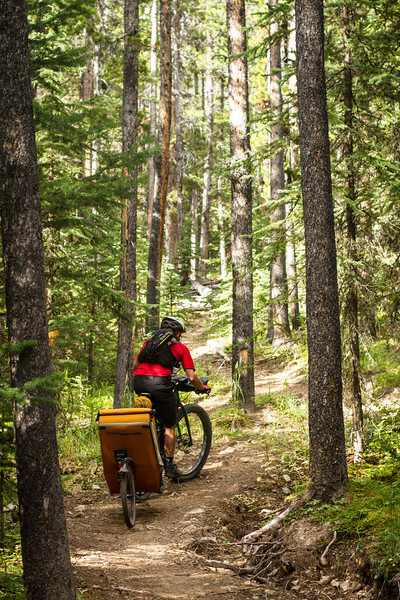 I want to try bikepacking without a campsite but not sure where I would be allowed to camp. Heya Monique – As far as we could work out, no permit is needed there – you just need to camp over 1km from the road. The Kananaskis regs are here: http://www.albertaparks.ca/kananaskis-country/information-facilities/camping/backcountry-camping/random-backcountry-camping/ – the whole of Kananaskis is a mix of all the types of parks, recreation areas, wildland provincial parks, public land use zones. Jumpingpound Ridge isn’t in a park or recreation area.